Every veterinarian signs up for lifetime learning, but those undertaking wildlife work must be particularly committed. Annabelle Olsson has made a career juggling full time work and study, and in the process, has refined crocodile treatment. Olsson graduated from the University of Sydney in 1985. She worked for a few years in general practice in Sydney before heading north to Cairns. In 1993 she established the FNQ Wildlife Rescue Association Incorporated, the first wildlife rehabilitation group in the Cairns region. Predictably, she was inundated with wildlife patients, and forced to do a lot of learning on the job. This was aided by a Master of Science at James Cook University, investigating aging factors and health parameters of free living spectacled flying foxes, and membership of the Australian and New Zealand College of Veterinary Scientists in avian health and medicine and husbandry of Australasian Wildlife. If it sounds like Olsson doesn’t sleep, it’s because she doesn’t. “Luckily, I survive long periods on four hours’ sleep, inherited from my father,” she said. Which came in handy when raising her six human offspring. Over the years Olsson also worked as a consultant to wildlife parks, local zoos, the Queensland Parks and Wildlife Service, the Cairns Port Authority and several commercial crocodile farms. For a brief time, she reared lion cubs in her home after their mother (on whom Olsson performed a caesarean) didn’t care for them. She was often called upon to immobilise both freshwater (Crocodylus johnstonii) and estuarine (Crocodylus porosus) crocodiles, for a range of reasons including to facilitate collection of morphometric data, scute marking for identification, placement of tracking devices, physical examination, blood collection and surgery. Immobilisation of large saltwater crocodiles presents unique challenges. Male salt water crocodiles can grow to a length of over five metres and are known for taking large prey – including humans. They exhibit formidable territorial aggression, and females are fierce in guarding their nests. More commonly, it is the animals who are killed. Delayed recovery leads to poor clearance of lactate and CO2. Better immobilisation drug protocols improve recoveries, and midazolam acts as an amnesiac, reducing stress related behaviours. Olsson found that immobilisation protocols reported in the literature were not only inadequate, but were inhumane. Non-depolarising paralysing agents such as gallamine and pancuronium were used, but neither provided analgesia or alleviated anxiety. She came a step closer during a fortuitous meeting after giving a talk on wildlife at Sydney University. She was talking to Larry Vogelnest about her interest in developing protocols and mentioned no one had any interest in supervising the research. Associate Professor David Phalen overheard and expressed immediate interest. Over five years, Olsson anaesthetised dozens of wild and farmed crocodiles. 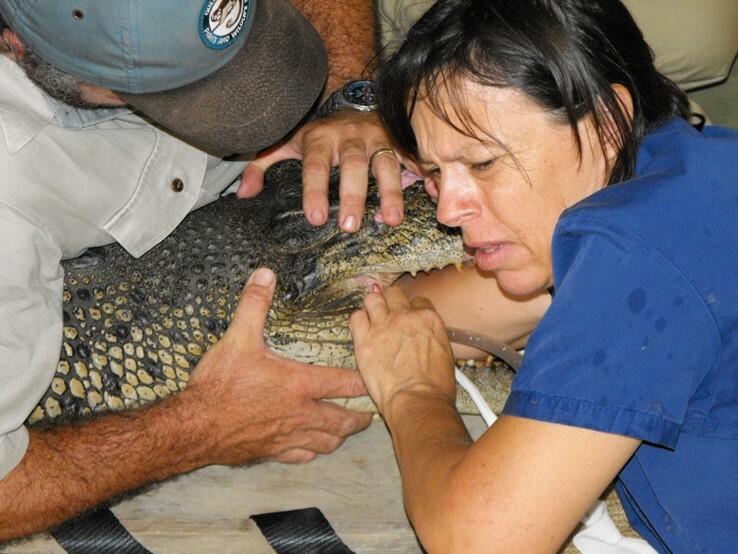 Much of Olsson’s PhD writing occurred before most of us awaken, but it paid off: she was the lead author on five journal articles that changed the way crocodiles were anaesthetised (Olsson and Phalen, 2013a, Olsson and Phalen, 2013b, Olsson and Phalen, 2012b, Olsson and Phalen, 2012a, Olsson et al., 2013). When it comes to large saltwater crocodiles, for example, Olsson premedicates with medetomidine at a metabolically scaled dosage (around 0.13mg/kg in a large male), injected into the triceps muscle. Once sedated and a chock is taped into their mouth, they can be manually intubated and maintained on isoflurane in oxygen. “I infuse local anaesthetic along the incision lines, and give them butorphanol and meloxicam post operatively,” she said. The medetomidine is reversed with atipamezole, which acts very quickly. Olsson finds that this protocol yields smooth recoveries. On two occasions, Olsson was called upon by the police to retrieve human remains from saltwater crocodiles. The first occasion involved a man who had been taken when checking crab pots in Cooktown. A 4.5-metre crocodile was caught nine days after the man went missing. “The family were adamant that they didn’t want crocodile killed, but the coroner requires proof of death,” Olsson said. So, she performed a gastrotomy and retrieved the remains of the man, along with a lot of echidna spines that the animal had ingested. The second case involved a five-year-old boy who was playing with his brother in floodwaters on the Daintree when he was taken. Again, the family did not want crocodiles sacrificed, so Olsson was called upon to perform another gastrotomy. The remains were retrieved. The animals survived and were relocated to crocodile farms. A typical working week for Olsson can be hectic. Every few weeks, Olsson spends a few days in an indigenous community working with local animal management teams and providing general vet care, preventative health programmes and dog and cat desexing. Olsson’s advice to aspiring wildlife vets is to spend a few years gaining skills and experience in general practice. These days most of her offspring have left the nest. As for the future, Olsson is keen to continue her work with wildlife. “We have established a wildlife hospital at the surgery and are about to develop this in conjunction with a much larger conservation project this year,” she said. OLSSON, A. & PHALEN, D. 2012a. Medetomidine immobilisation and atipamezole reversal in large estuarine crocodiles (Crocodylus porosus) using metabolically scaled dosages. Australian Veterinary Journal, 90, 240-244. OLSSON, A. & PHALEN, D. 2012b. Preliminary studies of chemical immobilization of captive juvenile estuarine (Crocodylus porosus) and Australian freshwater (C. johnstoni) crocodiles with medetomidine and reversal with atipamezole. Veterinary Anaesthesia and Analgesia, 39, 345-356. OLSSON, A. & PHALEN, D. 2013a. COMPARISON OF BIOCHEMICAL STRESS INDICATORS IN JUVENILE CAPTIVE ESTUARINE CROCODILES (CROCODYLUS POROSUS) FOLLOWING PHYSICAL RESTRAINT OR CHEMICAL RESTRAINT BY MIDAZOLAM INJECTION. Journal of Wildlife Diseases, 49, 560-567. OLSSON, A. & PHALEN, D. 2013b. The effects of decreased body temperature on the onset, duration and action of medetomidine and its antagonist atipamezole in juvenile farmed estuarine crocodiles (Crocodylus porosus). Veterinary Anaesthesia and Analgesia, 40, 272-279. OLSSON, A., PHALEN, D. & DART, C. 2013. Preliminary studies of alfaxalone for intravenous immobilization of juvenile captive estuarine crocodiles (Crocodylus porosus) and Australian freshwater crocodiles (Crocodylus johnstoni) at optimal and selected sub-optimal thermal zones. Veterinary Anaesthesia and Analgesia, 40, 494-502.